Ice fishing school is now in session. Time to gather up your gear and let's hit the ice! Many anglers that partake in this annual ritual are seasoned veterans, but there are a large number of individuals that are new to the sport and just really don’t know how to get started. At one time or another we were all in the same situation and we had to learn the ropes somehow. When it all boils down to it there really isn’t a time that I am out fishing that I am not learning something. You always need to keep an open mind to what you are doing and make adjustments when necessary. Learning is a big part of the game. I found a great way for the experienced and the inexperienced angler to learn more about ice fishing or for the experience angler to learn more about different methods of Ice angling. The “Mark Martin” Ice fishing vacation school is a wonderful way for anglers of all abilities to learn how to become a better ice fisherman. Mark Marin is a professional walleye angler and outdoor communicator. He has also recently been inducted into the “Freshwater Fishing Hall of Fame”. Mark’s resume not only includes many tournament wins out of his Lund, but also shows that he excels on the ice as well. Mark is backed by a large group of Pro-Staffers that assist him with his schools in teaching others about the sport of ice fishing. Armed with a combined 300+years of knowledge his crew can handle just about any question that is thrown at them. The Ice fishing vacation school has been a mainstay for over 20 years and many of the participants have come back year after year to learn more about fishing through the ice. Mark now holds three separate schools during the winter months. 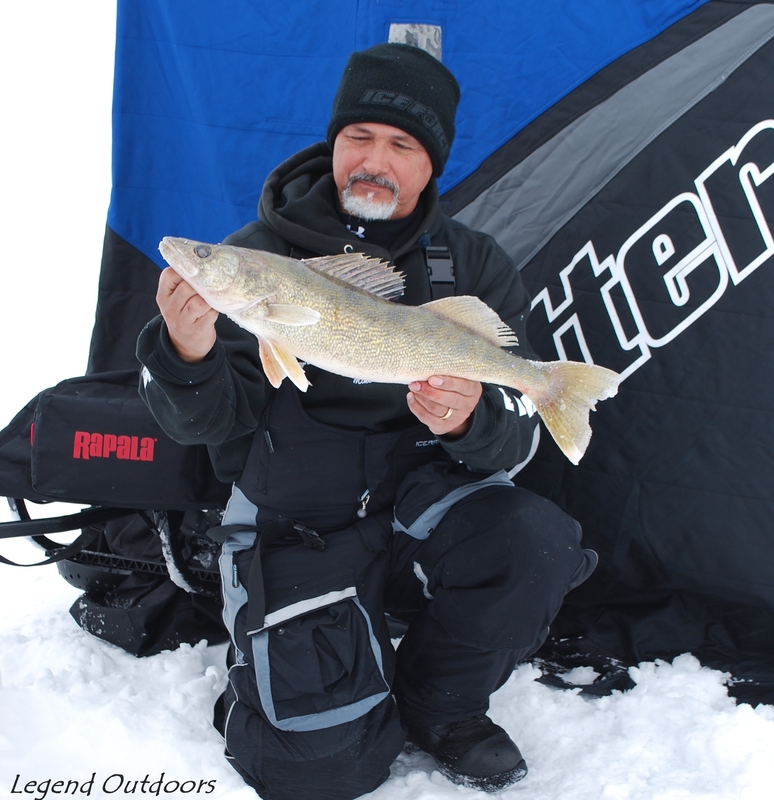 Mark has surrounded himself with great anglers that excel in many different aspects of the sport of ice fishing. Some anglers are walleye specific while others may focus on other species. Some prefer to use jigging rods while others like to use Tip-Ups. This diversity allows anglers to learn more about different methods of catching fish through the ice as well as to learn tips on how to improve their knowledge that they may already have. Each school starts off with a meet and greet with the anglers and pro-staff and an introduction into the fishing that will be occurring on the chosen body of water. Each pro-staffer offers up a short presentation on what they have found to work the best in the area and they focus on the techniques that work best for them. During these seminars you will get the low-down on what is working and tips on how to adjust your presentations to the fishing that will be occurring over the next three days. There are no secrets kept here, all information is divulged for all to learn and to benefit from. One of the important items that is conveyed in every seminar is the goal of safety on the ice. This is something that should not be taken lightly and each angler is given the tools and knowledge to be safe while enjoying the time out on the ice. I am an avid ice angler, but most of my time is spent chasing panfish on the local lakes. The adventure that the school takes out onto Saginaw bay after walleye was a huge learning experience for me and has allowed me to take these techniques and put them to use on my home waters. It would be difficult for any angler of any experience level to leave one of these schools without gaining immense knowledge that they can use on any body of water that they may fish. It is up to the angler to pay close attention and to retain the knowledge that is handed down to them from the many pros that are available. Every angler is paired off with a pro for the day on the ice and you will rotate throughout the day and days with other pros so that you can pick the brain of each of these experienced anglers. The experience will leave you with the confidence and abilities to catch fish on just about any lake you choose to fish. Thanks to the gracious assistance from the local bait shops and Convention and Visitor’s bureaus the school is able to offer the angler great accommodations, shopping opportunities, and fresh supplies of bait and tackle if needed. The next school starts soon so go to the web and look up the Mark Martin Ice fishing schools and sign up for your next adventure on the ice. This is an experience that you will not forget. If you go away without learning something then you did something horribly wrong. Good luck and I hope to see you out on the ice!